This film explores the practical and philosophical ideas of the late Robert Hart who, some 45 years ago, had a vision of planting a small food-producing forest which could fulfill the needs of a healthy diet and at the same time create a beautiful and ecologically sound environment. He based his ideas on tropical forest gardens, which combine maximum output with minimum labor. The film goes on to look at two other projects inspired by the principles of forest gardening and perennial vegetable growing. On a windy plot in Cornwall, Ken Fern has set up Plants for a Future, where he grows 1500 species of useful perennial plants (with a further 5,000 on a database). Ken's idea is to create a garden which caters for all our needs and can be enjoyed. And a few miles north of London, Mike and Julia Guerra have created a tiny garden as an inspiration to anyone wishing to act locally. For as little as two hours a week, they can grow produce for six months of the year, by successfully combining the techniques of permaculture design, forest gardening and conventional organic growing. 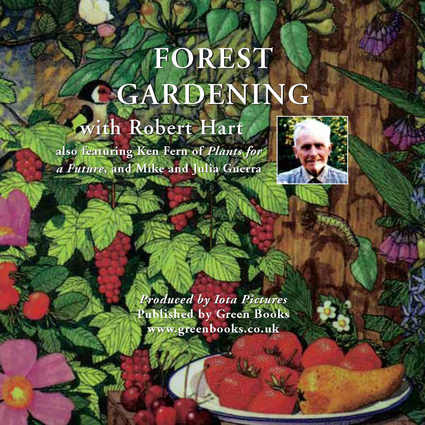 Robert Hart was the pioneer of forest gardening in the UK. His work inspired many others to pursue his vision of a more self-sufficient and vibrant community based on agroforestry techniques.